Home Uncategorized Wear the Right Socks! With the weather warming up, it’s time to get back outside and get back to outside work. And on the days when the sun is beating down, you’ll feel it on your neck, and you’ll feel it on your feet. For those of us who work outdoors, we know that the sweatiest, smelliest part of the whole day comes right down to your socks. Which is why wearing the right work socks can make all the difference. Whether they are made of cotton, acrylic, polyester, or anything else, the three biggest things we’re looking for are comfort, support, and durability. And these things can be accomplished in a number of different ways. For instance, when it’s warm out, the biggest thing that can help achieve comfort is a pair of socks that are designed to keep you cool. And since warm weather plus work tends to equal sweat, it’s important to have socks that keep you dry too. Moisture-wicking socks like Coolmax socks from brands like Wigwam and Thorlos are some of the most popular for accomplishing these goals. The polyester in the socks basically pull the beads of sweat off of your skin, allowing it to evaporate better and keeping your feet drier and feeling fresher. They also help cut down on blisters, which is huge at work, because heaven knows they happen with regularity when you’re working hard on your feet all day. Support can come from your work socks in a number of ways, but one of the most sensible simply has to do with making sure you’re feet are operating at full strength and stamina. Compression socks are great for warm weather work because they foster better circulation for your feet. This can really make a difference in fighting fatigue if you’re on your feet all day. Safety toe socks are another great option for support, comfort, and durability. If you wear steel toe boots, that extra little bit of padding can make a big difference in the comfort department, and working in tandem with the protection offered by your steel toe boots, it can make a long, difficult day a lot easier to get though. And since working outside in warm weather can make all day seem like forever, the more support you can offer your feet the better. 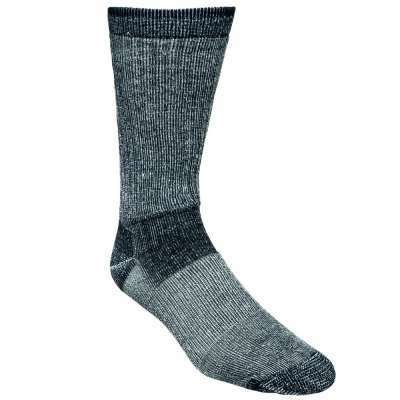 Merino wool socks are lightweight (always a plus in warm weather), are highly durable and long wearing, so they can also stand up to a beating on the job site while remaining super soft and comfortable. With merino wool socks, you get the benefit of wool without the itchy, scratchy feel. Working Person’s Store offers a wide selection of work socks that will help you combat the warm weather, equipping you for the things you need to get done, and helping you stay comfortable in the process. From leading brands like Wigwam, Dickies, Carhartt, Wolverine, Timberland, and many more, with tons of colors to choose from including tan, white, grey, blue, black, and lots of combinations of the above, WPS is sure to have just what you’re looking for. So get the right kind of work socks today. When you step outside in the warm weather, your feet will thank you. All day long. Next articleStay Safe in the Heat!